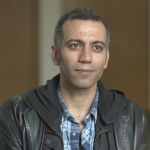 Hossam el-Hamalawy is an Egyptian journalist, blogger, photographer and socialist activist. He is a member of the Revolutionary Socialists and the Center for Socialist Studies. Since May 2006, el-Hamalawy maintained a blog on the The Arabist website. The Arabic and English-language blog covered various topics mostly related to Egypt, but also the Arab world, focused particularly on workers strikes, police abuse, corruption and global revolutionary movements. In 2006, he left The Arabist to set up his own website named “3arabawy” (“the Bedouin”) which has since been one of Egypt’s most popular blogs.